The graphic below illustrates the different decision points and options available to both customers and utility managers. The intra- and interrelation of customer and utility decision points/options requires the use a more sophisticated optimization model. This model provides the user with decision support to guide investments in microgrid equipment and operations. Previously, customers making decisions about microgrids have relied upon a standard discounted cash flow model (“DCF”). 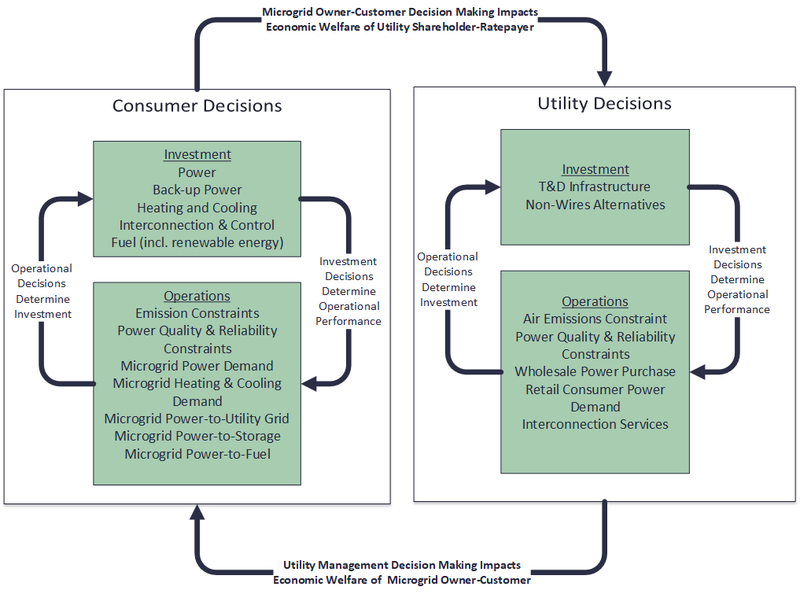 Applied research published in engineering and economics journals now suggests a very large benefit to microgrid owners and customers and utility rate payers/shareholders from using more complex decision-support models based on real options analysis (“ROA”). DCF calculates NPV by discounting net cash flows on a year-by-year basis over an assumed operating period based upon an initial investment in microgrid equipment. Quantitative financial analysts refer to this process as backward recursion. However, backward recursion does not account for so-called forward path dependencies. For example, managers have flexibility going forward to make operating decisions in each year that improve the overall NPV of a project and knowledge of the probability of such decisions may change the amount and types of investment. ROA uses off-the-shelf solution algorithms to simultaneously solve equations describing the interrelated investment and operating decisions. DCF also typically does not account for the fact that many different decisions of microgrid owners and an independent utility company will impact microgrid investments/operations and that these decisions will impact one another simultaneously. Using game-theoretic solution techniques, ROA has been adapted to solve for an optimal portfolio of interrelated decision making. Many investment banks that make loans for microgrid development and private equity investors in microgrid development prefer the use of ROA. Also, numerous regulatory commissions have endorsed ROA as a superior means of efficiently investing in and operating microgrids. Though more complex than traditional DCF calculations, ROA has proven to be significantly more accurate at accounting for the decision flexibility contained within a microgrid. Real Options Analysis encompasses and simplifies the computational complexity of solving for an accurate optimization of microgrid investment and operating decisions where microgrid consumers have simultaneous and interrelated financial, environmental and reliability objectives. Real Options Analysis solves for an optimal portfolio of: 1) microgrid operating decisions (i.e. for retail electric power source, back-up electric power source, heating/cooling source, fuel type, and interconnection/control platform); and 2) microgrid investment decisions (i.e. dispatching generators downstream for microgrid electric power and upstream wholesale power exports and dispatching boilers and chillers or CHP for microgrid heating/cooling). The solution encompasses and simplifies the complexity of the investment and operating decisions simultaneously impacting one another and of intra- and interrelated decisions (i.e. intra in that a decision in one time impacts the same decision at a later time; inter in that one decision may impact another decision in the portfolio). Real Options Analysis solves for an optimal portfolio of decisions based on the probability of each decision at each point in time. Also, objective decision making can be made subjective by weighing probabilities and accounting for known decision biases observed in the market place (e.g. when deciding on whether to invest in on-site power, microgrid customers tend to under-weigh the probability of incurring costs due to a utility power outage). Using simulations from game theory, Real Options Analysis can include a portfolio of decisions for utility managers and shareholders and solve for microgrid investment and operating decisions that result in no financial regrets for non-microgrid utility rate payers and/or utility shareholders.